You’ve probably heard of the Thai massage, and you’ve definitely heard of the Swedish massage, but have you ever heard of the Gua Sha massage? Probably not – but that’s okay. There are so many different “types” of massage therapy practiced all over the world – too many to count surely – that it would be ridiculous to expect someone, anyone, to be familiar with all of them. But this is one type of massage you’re going to want to know about. Gua Sha is an ancient and unique approach to natural healing that has the potential to counter a variety of health issues faced by individuals today. Learn more about what Gua Sha is and how it can help you by reading our FAQ and common questions answered below. Gua Sha is a traditional Chinese massage therapy dating back at least 700 years, to the Ming Dynasty. Despite this technique having such a long history across Eastern Asia, it is only within the last few decades that this practice has made its way into the western world. Roughly translated, “Gua Sha” means “to scrape away fever”, as Gua is the Chinese term for rub or scrape, and Sha refers to an energy within the body that causes excess heat. Of course, in ancient times this technique was considered more of a spiritual practice, believing that the combination of the tools and the movements were able to rid one’s body of blocked “energies” that were causing the negative effects. Today, in western society, the concept is more scientific than spiritual, but follows the same general idea, only with the focus being on ridding the body of heat and inflammation, rather than of negative energies. How Gua Sha is performed is what makes it inherently different from some of the other more common massage techniques you may know of. While most massages are performed solely with one’s hands, the Gua Sha technique requires a tool – a firm object possessing smooth, rounded edges – to use against the skin. Traditionally, a soupspoon, coin, or piece of water buffalo horn are used, but over the years and with the transition to western society, a variety of other tools – even tools made specifically for this purpose – are now common within the practice as well. After the targeted area is oiled, the tool is then used, specifically at a 45-degree angle, to rub a combination of long and short downward strokes across the skin. This is done to bring the heat to the surface of the skin, with the intent of releasing it from the body. Most commonly, this technique is used on the back, neck, arms, legs, and buttocks, but is also sometimes performed (more delicately) on the chest and face. Where the massage is performed depends on what type of issue is being treated. Typically, this type of massage therapy is used to increase blood flow, reduce inflammation, and boost the immune system. By doing this, Gua Sha is believed to be able to treat a number of conditions varying from acute or chronic disorders, the common cold or flu, and everyday aches and pains. A Stimulated Immune System – when Gua Sha is performed, it helps to activate the recipient’s immune system. With the immune system activated, the body is better able to speed up its natural healing process. This allows the recipient to better combat current illnesses and is proactive in helping one to avoid future illnesses. Reduced Pain – because Gua Sha is a natural anti-inflammatory, it can significantly reduce both chronic and acute pain caused by a number of different issues that center around inflammation of different parts of the body. Increased Circulation – the ways in which Gua Sha stimulates the body helps to increase the circulation of various fluids within the body. The improved circulation helps our bodies better rid themselves of waste, specifically metabolic waste, which congests our muscles. 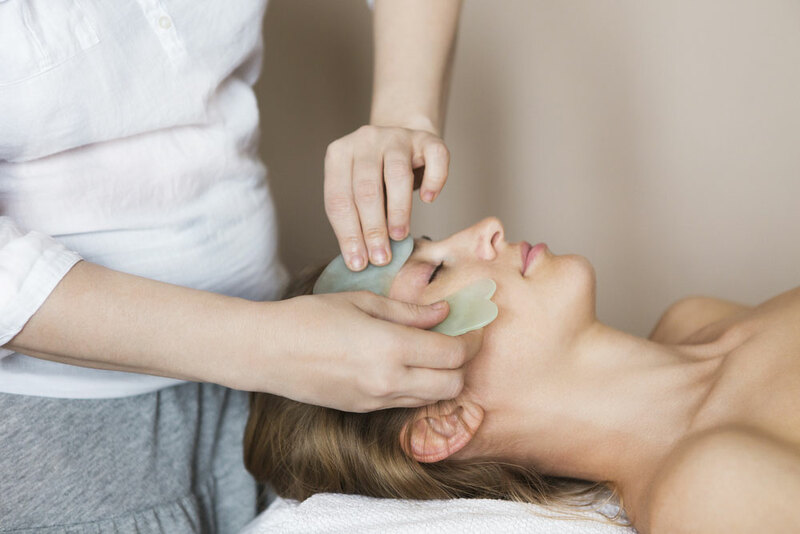 Anti-Aging Properties – this is, of course, not one of the medical benefits of Gua Sha, but who wouldn’t want to add a massage to their beauty routine? A gentler version of Gua Sha used on the face can help smooth lines and wrinkles, tighten the skin, and decrease puffiness around the eyes. Aside from the various chronic illnesses often treated with Gua Sha, a number of studies have been done determining that Gua Sha has in fact promoted healing for a an even larger array of health concerns, including (but not limited to): Hepatitis B, migraines, Tourette’s, and Perimenopausal syndrome. In each of the case studies, patients noticed improvements with their symptoms, such as reduced pain and discomfort, less anxiety, and even cured insomnia. While Gua Sha is a safe technique, it is still in one’s best interest to contact their doctor or another medical professional before seeking treatment – and seek treatment from someone qualified to perform the massage properly. Is Gua Sha For You? If you believe Gua Sha may be beneficial in treating an ailment you are struggling with, discuss it with your doctor. Gua Sha, when performed correctly, can have an amazing impact on many different issues and can truly help to improve the quality of life for the individuals struggling with those issues. Aside from its healing effects, Gua Sha can be a great way to simply relax and soothe your muscles and mind. With benefits like these, there is really no harm in considering Gua Sha as a treatment (or just a treat). Find a qualified therapist near you now and experience it for yourself.